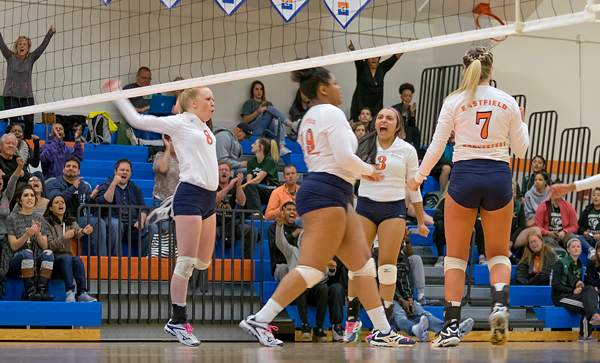 After not having dropped a single set in regular conference play, Eastfield women’s volleyball team was challenged in their 3-2 playoff semifinal win versus Cedar Valley to advance to the conference final versus Brookhaven. However, Keishla Reyes, the nation’s current leader in service aces (100), came off with an groin injury in the third set. Reyes injury was not serious enough to keep her from playing the next game the following day. Eastfield coach Brandon Crisp said he was glad to beat an opponent who caused the team plenty of adversity. The Harvesters, who hosted the tournament as the top seed, saw a significant home-court advantage. “Let’s go Eastfield, let’s go!” chants resonated through several parts of the Harvester’s bleachers between rallies. In the first set, the hosts took a 4-1 lead, but Cedar Valley clawed back and turned it around to lead 6-5. The Harvesters pulled back to tie the set 15-15. At the end of the set, the team had the game-point at 24-23, but the Suns then made it 25-24 in their favor. Eastfield won the next three rallies to take the first set. In the second set, the Harvesters won nine out of 13 points. Communication errors and a lack of efficiency in kills slowed the Suns. But, Cedar Valley slowly cut the lead and with the Harvesters on game-point, 24-22, the visiting side won the next four points to tie the match 1-1. Setter Kalli Caddell said the Suns gave the team a hard time and credited them with the performance. Eastfield flew to a strong star in the third, winning 11 of 15 points, with outside hitters Keishla Reyes and Kerstin Fredrickson racking up kills at the net. Later, Reyes reached for a dig that was a little too far forward and landed awkwardly on her extended left leg and came off with a groin injury. Right-side hitter Jennifer Contreras stepped on in her place and finished the game. She said it was difficult playing in that high-pressure situation. Caddell said Contreras stepped up and filled in the role perfectly. It’s unsure if Reyes will play in the final tomorrow at noon. In the fourth set, both teams started evenly and neither held more than a two-point lead until Cedar Valley went up 9-6. From there, Eastfield played catch up and tied the game twice, but the Suns eventually took the set and tied the game 2-2. In the fifth, the Harvester’s again took the lead as Cedar Valley made more costly errors. The team never looked back, scoring four consecutive points to give them a 10-5 lead and eventually win the match. Fredrickson ended the match with 21 kills and 14 digs while Reyes had 10 kills and 8 digs. Middle blocker finished with a further 18 kills and 4 digs. Crisp said it was a challenging game with a strong opponent and a shift in tactics after the injury but the team is focused now on the final.